Following its most successful recording, The Art of Fugue, the Emerson String Quartet again dedicates its mastery to the music of J.S. Bach. The quartet, which celebrated its 30th anniversary in 2007, presents the world-premiere recording of the four-part fugues from the famous Well-Tempered Clavier as arranged for string quartet. 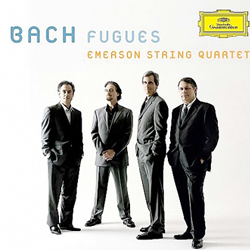 The Emerson Quartet's 2003 release of The Art of Fugue was a critical and commercial success selling 50,000 units worldwide. Repertoire from this world-premiere recording will be included in the Emerson Quartet's touring program.